Dr. Stuart Scott, the pediatric dentist at Parkcrest Dental Group, looks forward to your child’s dental visit. 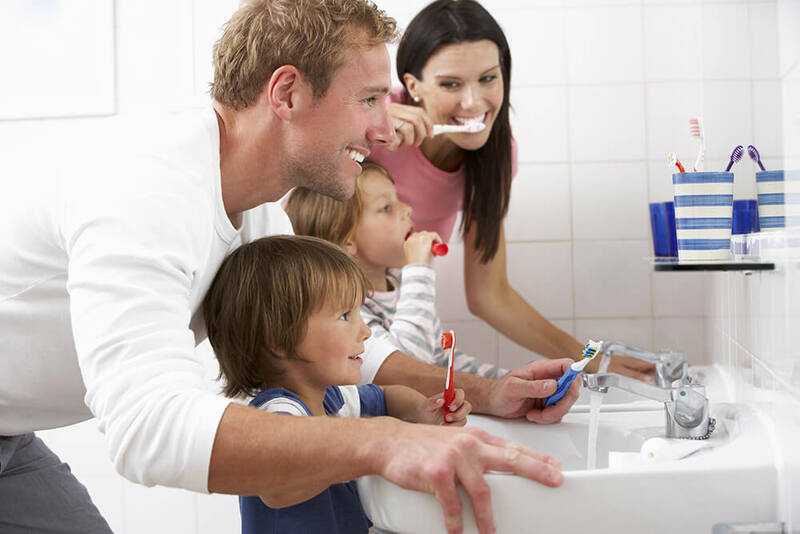 His foremost goal is to instill a positive dental attitude for your child and help them through their dental visits revealing healthy and happy smiles. Dr. Scott has called Springfield home since 1993. Born in Iowa and moving to Nebraska as a young boy, he completed his preparatory education in Lincoln from kindergarten through dental school. While in dental school at the University of Nebraska Medical Center College of Dentistry, he developed a passion for working with children. Following his graduation, he completed a two-year specialty residency in Pediatric Dentistry at the University of Texas Health Science Center at San Antonio. Upon completion of his residency, he moved to Springfield and joined Parkcrest Dental Group. 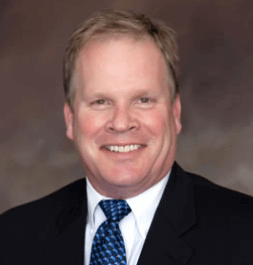 Dr. Scott is licensed by the state of Missouri as a Dental Specialist in Pediatric Dentistry. He is Board Certified in Pediatric Dentistry by the American Board of Pediatric Dentistry. In addition, he has Fellowship status in the American Academy of Pediatric Dentistry and the International College of Dentists. He is a member of the American Dental Association, Missouri Dental Association, and is a past president within the Greater Springfield Dental Society. He holds hospital privileges with both Mercy and Cox Hospitals as well as at the C. Rex Witherspoon Surgery Center in Springfield. In his spare time Dr. Scott enjoys family, friends, and the wonderful outdoors in the Ozarks. He is thrilled to watch his children grow and enjoys being active at church and in the community. A child’s first visit to the dentist should be enjoyable. Children are not born with a natural fear of the dentist, but they can fear the unknown. Parkcrest Dental Group makes a special effort to use pleasant, non-frightening, simple words to describe each treatment. We want you and your child to feel at ease from the moment your family arrives at our pediatric dentistry office. The more you and your child know about the first visit, the better you will feel. Children should visit the dentist by their first birthday. 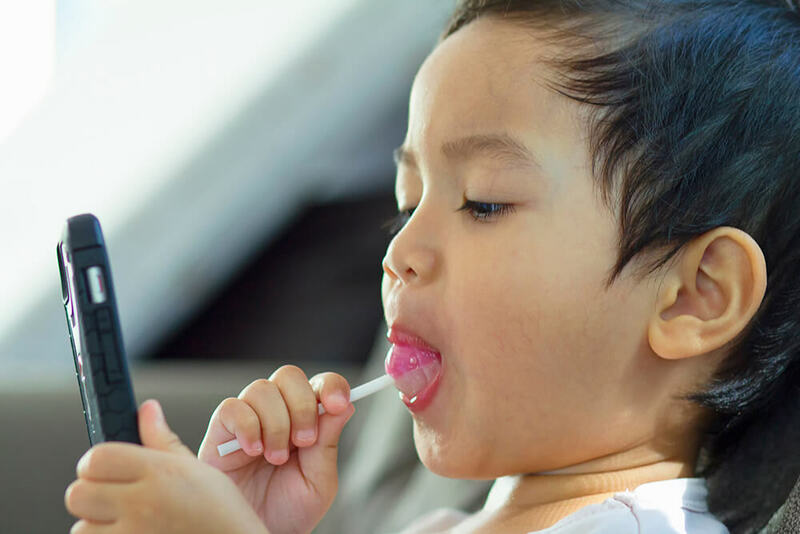 It is important that your child’s newly-erupted teeth (erupting at six and 12 months of age) receive proper pediatric dentistry care and benefit from proper oral hygiene habits right from the beginning. Choose Dr. Scott as your child’s dentist! Getting to know your teeth is fun! 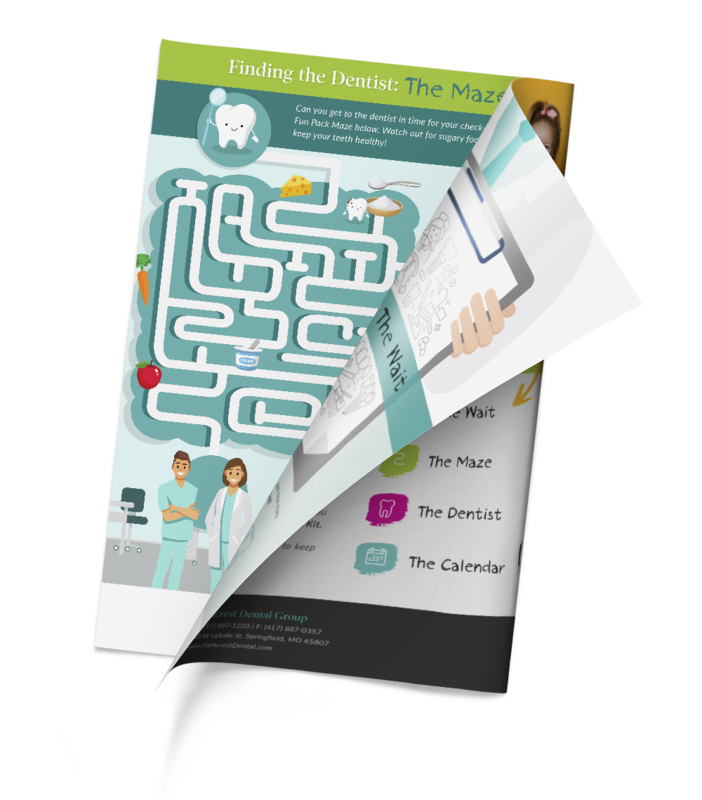 Download our Dynamite Dental Fun Kit Today! Your child’s first primary or baby teeth will begin to erupt between the ages of six and 12 months, and will continue to erupt until about age three. During this time, your child’s gums may feel tender and sore. To help alleviate this discomfort, our pediatric dentistry recommends that you soothe the gums by rubbing a clean finger or a cool, wet cloth across them. You may also choose to make use of a teething ring. When your child has finished teething, you can expect a total of 20 primary teeth. Tooth decay is caused by sugars left in your mouth that turn into an acid, which can break down your teeth. Children are at high risk for tooth decay for a simple reason: many children and adolescents do not practice regular, good oral hygiene habits. 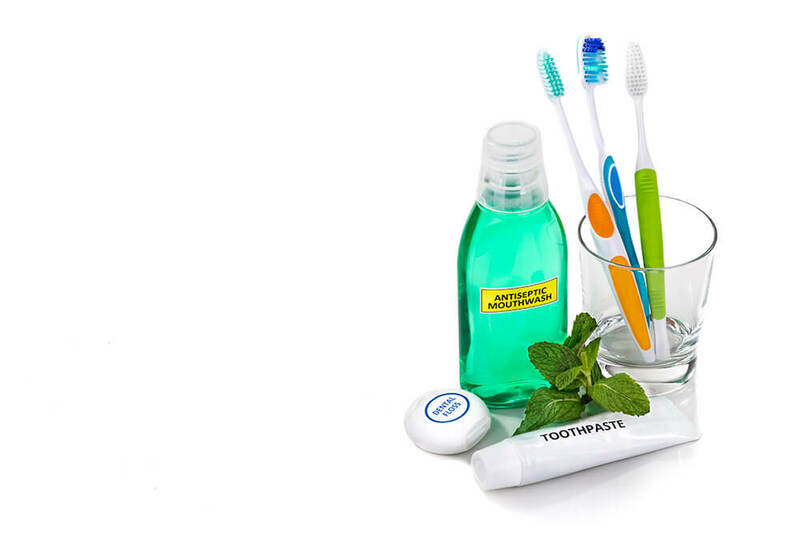 Proper brushing and flossing routines combined with regular dental visits at Parkcrest Dental Group help keep tooth decay away and prevents a dental emergency. Your child should visit a pediatric dentist every six months for regular dental cleanings and checkups. We recommend fluoride treatments twice a year along with cleanings to keep teeth their strongest. Tooth sealants are also recommended because they “seal” the deep grooves in your child’s teeth, preventing decay from forming in these hard-to-reach areas. Sealants last for several years, but will be monitored at your child’s regular checkups. Brushing can be fun, and your child should brush as soon as the first tooth arrives. When a baby’s tooth erupts, parents should brush the tooth with a soft-bristled toothbrush and a pea-sized amount of toothpaste. For children younger than two, do not use fluoride toothpaste unless advised to do so by your pediatric dentistry or other healthcare professionals. We suggest reviewing proper tooth brushing procedures with your child. Flossing is also a part of good oral hygiene habits, and your doctor will discuss with you the right time to start flossing. If you notice signs of decay, contact your pediatric dentist at Parkcrest Dental Group immediately. It’s important that your child starts practicing good dental habits in their early years so their teeth can be healthy in their later years. Dr.
in Springfield, MO, or contact us today to set up an appointment.